Send a heartfelt expression of your sympathy. 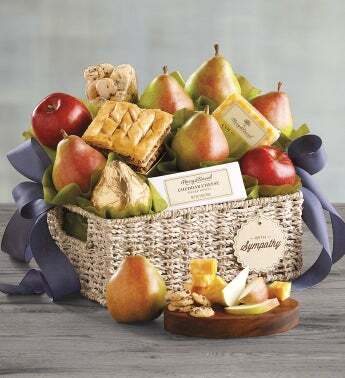 This tasteful gift includes juicy Royal Verano® Pears from our orchards, sweet baklava and indulgent chocolate chip button cookies from our bakery, and savory cheeses like Colby Jack and sharp white cheddar. The gourmet treats arrive in a reusable, whitewashed seagrass basket adorned with a "With Sympathy" tag and topped with a hand-tied bow.